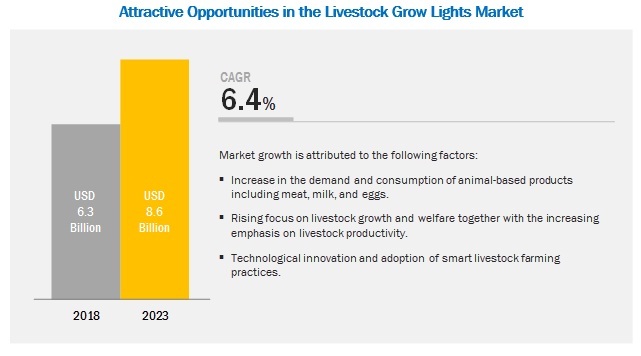 [135 Pages Report] The market for livestock grow lights is projected to grow from USD 6.3 billion in 2018 to USD 8.6 billion by 2023, at a CAGR of 6.4% during the forecast period. This is attributed to technological innovations and the adoption of smart livestock farming practices. However, the increase in the demand and consumption of livestock-based products and the rising focus on livestock growth and welfare together with the emphasis on livestock productivity drives the demand for using grow lights in livestock barns. By type, the LED segment is projected to witness the fastest growth in the livestock grow lights market during the forecast period. The LED segment is projected to witness the fastest growth due to its significant energy savings and longer durability properties. In addition, it is more energy-efficient with one-fifth of the power consumption of incandescent bulbs. LED grow lights provide a wide range of spectrum from blue to red that can be customized to the desired spectrum as per the spectral sensitivity of the livestock. By optimizing different spectrum levels and radiation, farmers could create lighting environment that is best suited for their livestock’s wellbeing. Based on the livestock segment, the market is estimated to be dominated by the cattle segment in 2018. In dairy farms, grow lights help in improving the output of milk production from dairy cattle; whereas in beef cattle, grow lights are used to stimulate muscle growth to increase meat production. Further, the constantly rising demand for dairy & dairy-based products including milk, cheese, yogurt, and butter in both, developed and developing economies are projected to drive the demand for grow lights in cattle farms. Asia Pacific is projected to account for the largest market share during the forecast period. The Asia Pacific market accounted for the largest share in the livestock grow lights market. The large market share in this region is attributed to the presence of large livestock population (FAO STATISTICS 2016) and their growth. Furthermore, the rising number of livestock farms and the growing size of existing farms are also projected to contribute to the large market of the Asia Pacific region. The major vendors in the global livestock grow lights market are OSRAM (Germany), Signify Holding (Netherlands), DeLaval (Sweden), Big Dutchman (Germany), Uni-light LED (Sweden), Once Inc. (US), AGRILIGHT BV (Netherlands), Aruna Lighting (Netherlands), HATO BV (Netherlands), Shenzhen Hontech-Wins (China), CBM Lighting (Canada), Fienhage Poultry Solutions (Germany), SUNBIRD (South Africa), ENIM UAB (Lithuania), and Greengage Lighting (UK). These players have broad industry coverage and strong operational and financial strength; they have grown organically and inorganically in the recent past. The industry players, such as Once Inc. (US) launched AgriShift HL-UVA, a 3-Watt LED in January 2017, which provides stimulus for feeding and promotes animal health. Moreover, key industry players such as Big Dutchman (Germany) launched Zeus in October 2016, the first LED lamp with replaceable parts, which is cost-efficient for the poultry farmers. In June 2018, Once Inc. (US) announced the acquisition of iLOX GmbH (Germany) and its subsidiary iLOX Sp.z.o.o. (Poland). This acquisition would help the company to develop innovative lighting technologies for the livestock growing agricultural market with a special focus on animal welfare. In May 2018, DeLaval (Sweden) opened a new distribution center in Germany. This would help the company to reduce the lead time and store more products, strengthening its logistics services. In January 2018, Uni-light LED has developed a High Bay light 275W to expand its product portfolio. In October 2016, HATO BV (Netherlands) launched BUBO, tubular lighting for cage housing and aviaries to provide appropriate light for proper feed and water intake. Who are the major market players in livestock grow lights market? What are the regional growth trends and the largest revenue-generating regions for livestock grow lights? Which are the major regions that are projected to witness a significant growth for livestock grow lights? What are the major types of livestock grow lights that are projected to gain maximum market revenue and share during the forecast period? Which is the major type of livestock where grow lights are used that will be accounting for majority of the revenue over the forecast period? 10.5.3.1 Increasing Domestic Poultry Production, Expansion of Poultry Farms is Expected to Increase New Installation of Lighting Technology, Such as LED in Poultry Farms. The study involved four major activities in estimating the current market size for the livestock grow lights market. Exhaustive secondary research was done to collect information on the market as well as the parent market. The next step was to validate these findings, assumptions, and sizing with industry experts across the value chain through primary research. Both the top-down and bottom-up approaches were employed to estimate the complete market size. Thereafter, market breakdown and data triangulation were used to estimate the market size of segments and subsegments. In the secondary research process, various sources were referred to, so as to identify and collect information for this study. These secondary sources included reports from the Food and Agriculture Organization (FAO), United States Department of Agriculture (USDA), Ontario Ministry of Agriculture, Food and Rural Affairs (OMAFRA), National Livestock Producers Association, International Light Association, and Maine Association of Livestock Exhibitors, annual reports, press releases & investor presentations of companies, white papers, certified publications, articles by recognized authors, regulatory bodies, trade directories, and databases. The overall livestock grow lights market comprises several stakeholders such as grow lights traders and distributors, livestock farms & rearers, government organization, and research institutions in the supply chain. 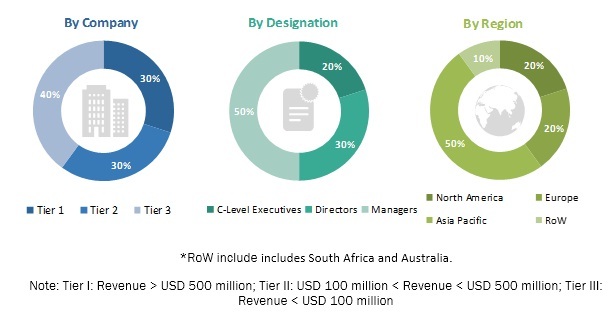 The demand side of this market is characterized by the development of the livestock farm industries, the rise in livestock population, and an increase in the consumption of animal-based products. The supply side is characterized by advancements in technology. Various primary sources from both, the supply and demand sides of the overall market were interviewed to obtain qualitative and quantitative information. The livestock grow lights industry’s value chain and market size, in terms of value and volume, were determined through primary and secondary research. After arriving at the overall market sizes-using the market size estimation processes as explained above—the market was split into several segments and subsegments. In order to complete the overall market engineering process and arrive at the exact statistics of each market segment and its subsegments, the data triangulation and market breakdown procedures were employed, wherever applicable. The data was triangulated by studying various factors and trends from both the demand and supply sides of the livestock grow lights industry. The market size was validated using the top-down and bottom-up approaches. This research report categorizes the livestock grow lights market based on type, livestock, installation type, color type, and region.